Hussain Sagar Lake is located on the merging point of Secundarabad, Hyderabad and Begumpet. This man made artificial lake was established by Sultan Ibrahim Kutb Shah in 15th century spending just 2.5 lakhs. The lake was main source of water supply in ancient times. The actual size of the lake was shrunk up to 40 % due to public and private encroachment. Amidst this sprawling lake, you can see a Huge monolithic statue of Buddha. The statue was carved out of 450 ton weighing white marble stone by nearly 200 sculptors. 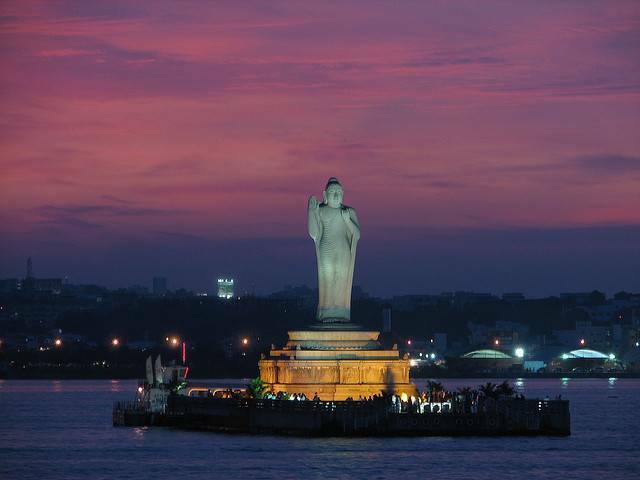 Boat rides are available from Lumbini Park up till the Buddha Statue in Hussain Sagar Lake.